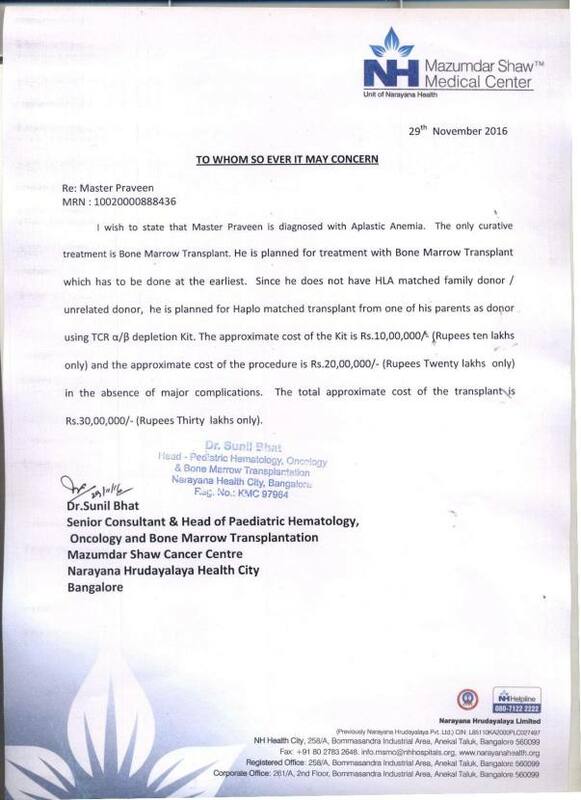 Praveen is diagnosed with Aplastic Anemia. His parents have been identified as potential donors and a Bone Marrow transplant is his only hope. Aplastic Anemia is a rare disease that damages the bone marrow, due to which the production of new blood cells complete seizes. A terminal disease, if not detected early. Fortunately in Praveen's case, Madiwal appa his father immediately took him to the doctor when Praveen started to vomit blood. This raised serious concerns for his father and mother. Not really aware of what was going on, Madiwal appa and Bhagamma brought him to a hospital in Bangalore. A blood transfusion was done but no diagnosis on what the problem was. Finally at Narayana Hrudayalaya they were informed of the problem. Praveen hails from a remote village in Kalburgi district of Karnataka. 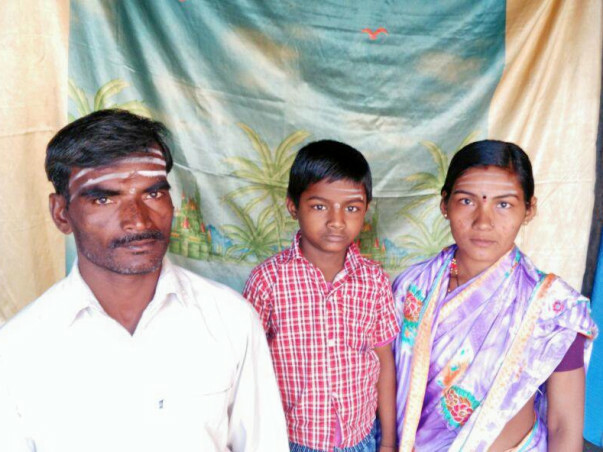 Both parents are farmers and have given up everything to save Praveen. He also has 2 other siblings. This also makes it harder for Madiwal appa to pay for Praveen's treatment. Madiwal appa and Bhagamma are still not aware of the seriousness of the disease but are only hoping that it will be solved soon and Praveen can get back to his normal life again. He needs your support. The approximate cost of the surgery is 30 Lakhs. Thank you for your tremendous love and support. We couldn't have imagined treating him without your support. With inexplicable grief, we're having to inform you all that Praveen passed away. There were complications which eventually started worsening his health. We gave him the best of treatment possible but we couldn't save him. Thank you everyone for being with us. We shall forever be indebted to you. Praveen had to undergo a Bone Marrow Transplant but was diagnosed with severe Sepsis because of which he was admitted to the hospital one month before initiating the transplant process. He was in intensive care for a few weeks. Now, he has completed the BMT process but has failed to engraft and also has Sepsis. He is in a critical condition and is currently under treatment. We thank you for the timely support to help Praveen undergo the treatment. I am Debotri Roy, a Milaap Open Fellow. Here is an update on Praveen's health. I spoke to his uncle, Guru, today morning. "He has been suffering a lot the last few days. His health condition has deteriorated. We admitted him to the hospital on Monday, February 6," he said. For the first two days, he was in the Intensive Care Unit after which he was shifted to the general ward. Although his fever and vomiting are under control, his RBC and WBC count have reduced alarmingly. From yesterday's report: his haemoglobin level was as low as 4.7. The child is struggling with another viral infection, which has affected his urinary bladder. There is blood in his urine and passing it is very painful. He is also suffering from an abnormally swollen face, eyes and lips. The doctor has successfully ordered the TCR alpha/beta depletion kit from Germany for Praveen. But due to his fluctuating health, the date for the bone-marrow transplant cannot be fixed. "With your help and support, the funds have been arranged. Thank you so much for coming forward. I just wanted to say THANK YOU in the biggest way to all donors," said his father. However, the parents are broken because of their child's health. Please pray for his speedy recovery. We will keep you posted on the his progress.